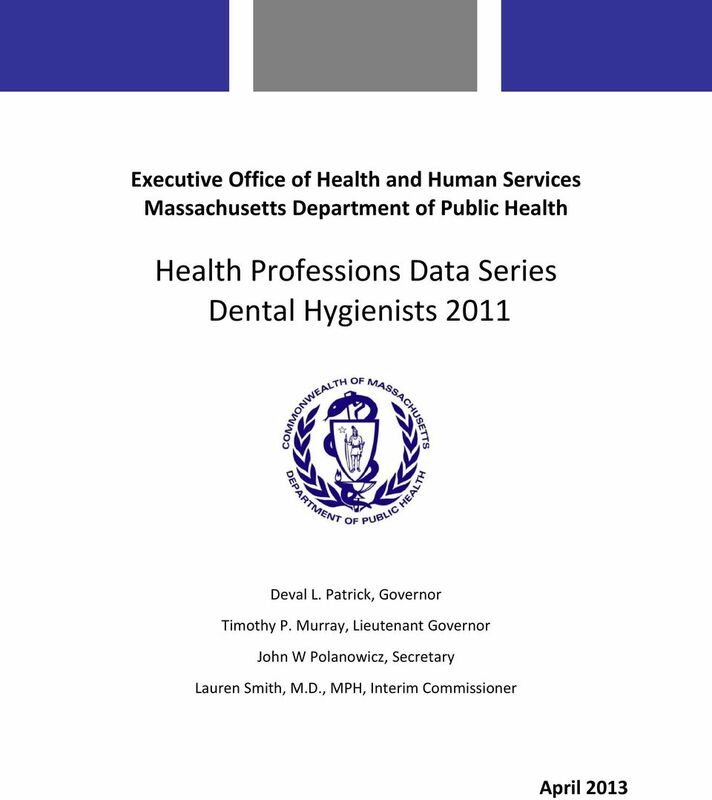 Download "Health Professions Data Series Dental Hygienists 2011"
3 BACKGROUND During the 2011 license renewal cycle, 6,735 dental hygienists were sent a renewal notice with an option of renewing their license online and completing 33 workforce survey questions. 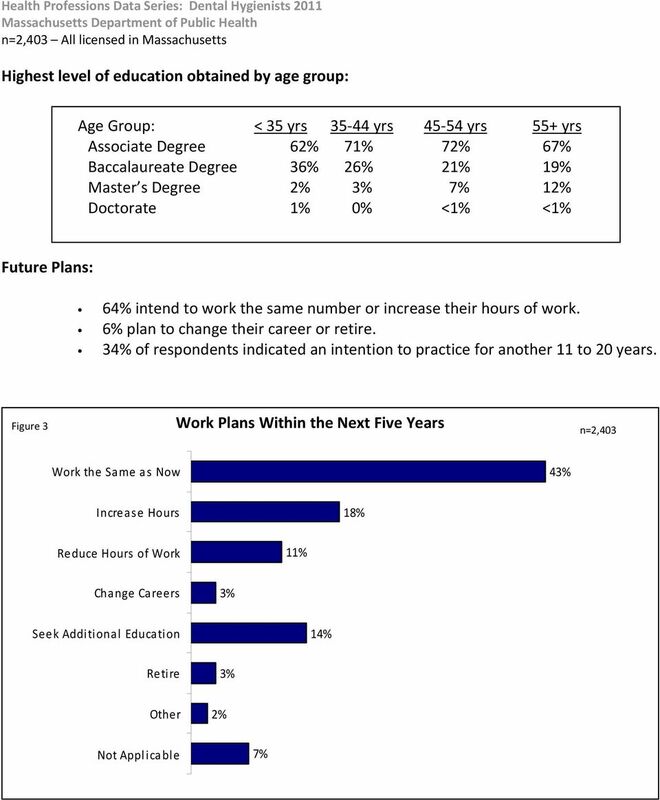 The survey included questions related to demographics, employment characteristics and future work plans. A total of 2,403 (36%) dental hygienists completed the online survey, of which 1,889 (79%) reported practicing in Massachusetts. The results should be quoted with caution as the representativeness of the dental hygienist respondents for this report is unknown. The following data represents the responses of all Dental Hygienists who completed an online renewal between January 2011 and June DEMOGRAPHICS 2 n = 2,403 All licensed in Massachusetts Gender: Males: 2% Females: 98% Dental Hygienists by Age Figure 1 n = 2,403 Average Age: 42 years Age Range: years 29% 28% 25% Race: White, Non Hispanic (NH): 86% Black, NH: 2% Asian, NH 4% Native Hawaiian/Pacific Islander, NH: <1% Hispanic: 3% Decline to Answer: 4% 16% 2% < Age Categories (Years) Languages other than English most frequently spoken with sufficient fluency to provide adequate care: Spanish: 5% Portuguese: 3% French: 2% Russian: 2% Figure 2 Distribution of Dental Hygienists by Years in Practice n = 2,403 25% 7% 14% 12% 10% 18% 15% EDUCATION < >30 Years in Practice 2 Percentages may not add to 100% due to rounding or the respondent s ability to select more than one answer. 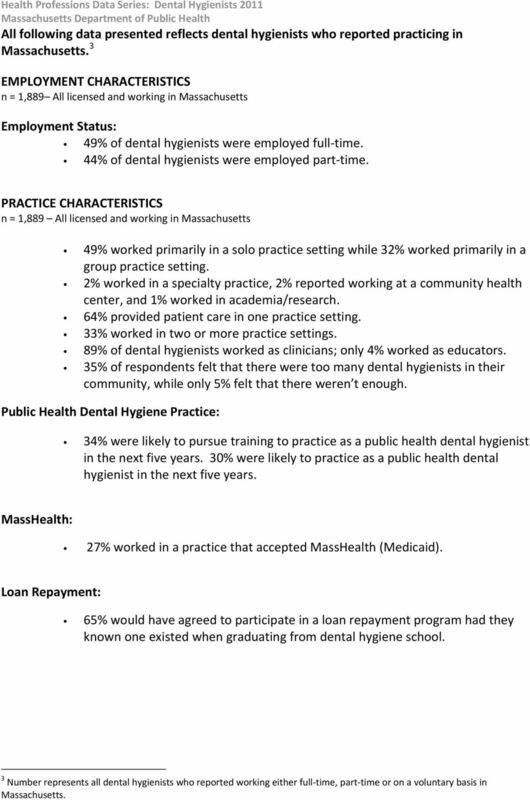 5 All following data presented reflects dental hygienists who reported practicing in Massachusetts. 3 EMPLOYMENT CHARACTERISTICS n = 1,889 All licensed and working in Massachusetts Employment Status: 49% of dental hygienists were employed full time. 44% of dental hygienists were employed part time. PRACTICE CHARACTERISTICS n = 1,889 All licensed and working in Massachusetts 49% worked primarily in a solo practice setting while 32% worked primarily in a group practice setting. 2% worked in a specialty practice, 2% reported working at a community health center, and 1% worked in academia/research. 64% provided patient care in one practice setting. 33% worked in two or more practice settings. 89% of dental hygienists worked as clinicians; only 4% worked as educators. 35% of respondents felt that there were too many dental hygienists in their community, while only 5% felt that there weren t enough. Public Health Dental Hygiene Practice: 34% were likely to pursue training to practice as a public health dental hygienist in the next five years. 30% were likely to practice as a public health dental hygienist in the next five years. MassHealth: 27% worked in a practice that accepted MassHealth (Medicaid). Loan Repayment: 65% would have agreed to participate in a loan repayment program had they known one existed when graduating from dental hygiene school. 3 Number represents all dental hygienists who reported working either full time, part time or on a voluntary basis in Massachusetts. DHCFP. Barriers to Obtaining Health Care among Insured Massachusetts Residents. Sharon K. Long and Lokendra Phadera Urban Institute. 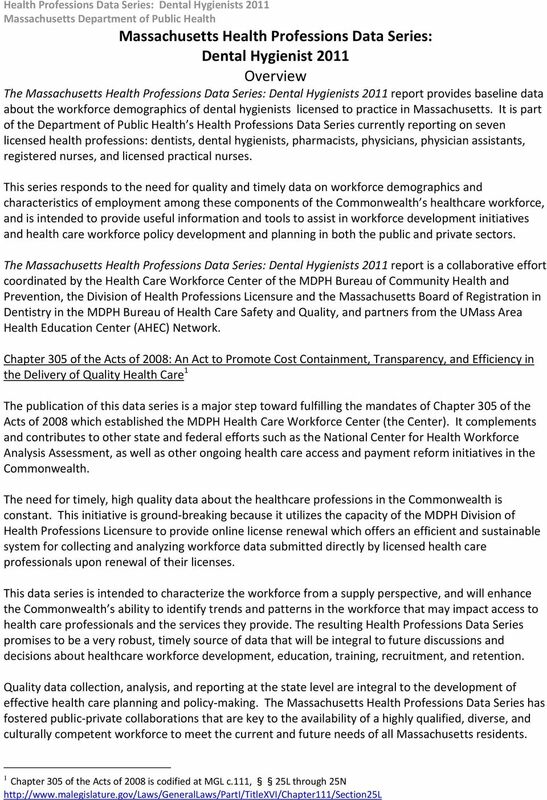 The Commonwealth of Massachusetts Executive Office of Health and Human Services Department of Public Health 250 Washington Street, Boston, MA 02108-4619 August 6, 2015 CHARLES D. BAKER Governor KARYN E.